The U.N. chief said the U.N., African Union and the regional block IGAD have a common strategy to lessen the violence in South Sudan. NAIROBI: The risk of genocide in South Sudan has "considerably diminished" though much fighting there continues, the United Nations secretary-general said Wednesday. Antonio Guterres made the comment in response to a reporter's question about a new U.N. report saying warning signs for genocide are in place in South Sudan. The report by the U.N. Commission on Human Rights into South Sudan describes deliberate starvation and bombardment of civilians, as well as the use of hate speech by top officials including President Salva Kiir. 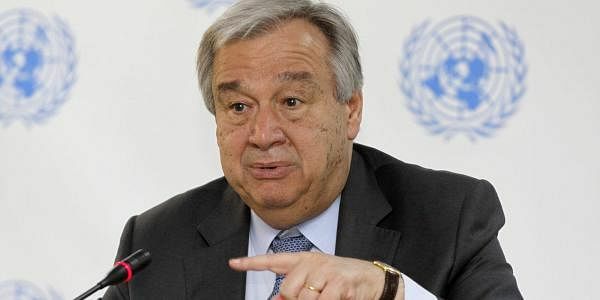 "We still have many incidents taking place, many fighting taking place ... but the risks of genocide have considerably diminished," Guterres said. The U.N. chief said the U.N., African Union and the regional block IGAD have a common strategy to lessen the violence in South Sudan and start an all-inclusive dialogue. He gave no details. Previous attempts at peace, under pressure from the international community, have failed, and a number of South Sudan government and military officials recently resigned while warning of ethnic abuses. The U.N. has warned of ethnic cleansing in South Sudan, which has been devastated by three years of civil war. Last month, the secretary-general's adviser on genocide renewed his warning that indicators for genocide were in place. The U.N. commission's new report said violations have mainly been committed by South Sudan's security forces including the army, which is dominated by members of Kiir's Dinka ethnic group. Tens of thousands have been killed in the civil war, and more than 1.5 million people have fled the country. The U.N. and South Sudan's government recently declared famine in two counties as the upheaval has disrupted cultivation and markets. Guterres came to East Africa this week to witness Somalia's deadly drought crisis.